ClassicFox is a Firefox/Thunderbird extension that fixes the appearance of the default Firefox/Thunderbird theme in Windows Classic. 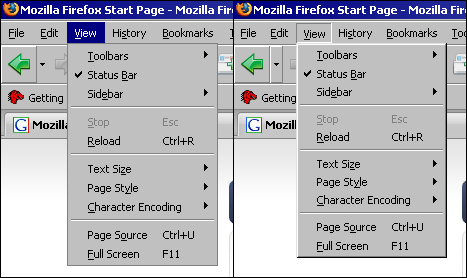 Specifically, it restores menus to the classic style, it restores the missing bevels (outlines) on toolbar buttons that have dropmarkers, and, in Firefox 3, it restores the Classic bevel to the address bar and search box. ClassicFox is customizable, and users can choose which of these "fixes" to enable. ClassicFox offers several fixes and tweaks. Each of these can be individually enabled or disabled through the extension's options. Also, depending on the application (e.g., is ClassicFox installed on Firefox 3 or is it installed on Thunderbird 2? ), some of these fixes and tweaks may or may not be available. Notes: This fix is not available (nor necessary) on Firefox/Thunderbird 3 because Gecko 1.9 uses native menu rendering. Notes: These two-part buttons are not used in Firefox 3, but some extensions may still be using them. Notes: This is a hidden option and is disabled by default. To enable this tweak, use about:config to set the value of extensions.classicfox.alwaysShowGo to true. Please note that any changes in the ClassicFox options will take effect only after a restart of the application. Can't I do this with userChrome.css? Why should I use an extension? It is much easier to install a new extension than it is to locate and manually edit userChrome.css. With an extension, there is no need to edit userChrome.css if you need to disable or re-enable these fixes. This can be quite handy when changing themes in either Firefox/Thunderbird or Windows. This extension is really nothing more than a packaged-up version of the userChrome.css file that I have been using. If you prefer to use userChrome.css instead of an extension, you can take a look at the CSS overrides used in ClassicFox.